Aman wanted to do something different than just a beach proposal in Maui. He knew that Meeta was adventurous and spirited. So he wanted an epic landscape to match who they are as a couple. Enter this Waihee Ridge Proposal. They actually flew in from Oahu that very same day. We typically don’t do proposals where you fly in on the same day, but we can when it’s inter-island. They flew in from Oahu early in the morning, stopped and got some breakfast, and then headed to the Waihee Ridge Trail. The first three-quarters of a mile of this trail are absolutely gnarly. You are going to get hot and sweaty. It’s a real work out. Aman somehow convinced Meeta to get dressed up to go check out this really cool view on the trail. She just kept saying,”What are we doing? Why are we doing this? 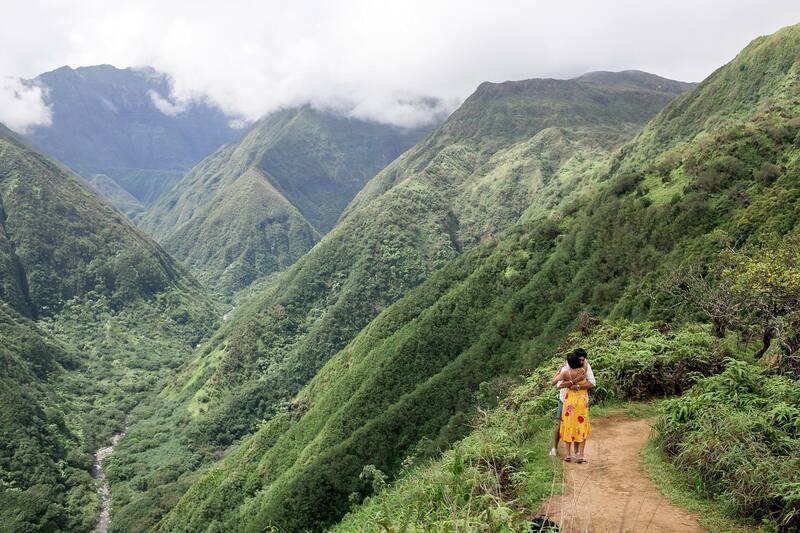 Why are we so dressed up for the hike?” But he kept reassuring her that he just wanted to see this really pretty spot and they would go on to their next Maui adventure after taking in this view. He got up to the right spot on the Ridge Trail and dropped to one knee. The proposal surprised the heck out of her! We had an absolutely beautiful day up there. This is one of those proposal spots that is the earlier the better. After the proposal was all done we did some photos up on the Ridge Trail itself and then for our second location we headed to a nearby beach so we could get some really beautiful blue water, blue sky shots for this newly engaged couple! Aman and Meeta: Congratulations on your epic Waihee Ridge Proposal! I love the adventure and fun of your proposal! Contact Engaged on Maui to start planning your epic proposal today!